For decades now, Michael Connelly’s mystery novels have been one of pop culture’s great untapped resources—at least officially. Connelly’s 1996 serial killer thriller The Poet has been mined repeatedly by screenwriters for plot twists and character beats, to the extent that it’d be all but impossible now to make a film of The Poet that wouldn’t seem derivative of the TV shows and movies that have ripped it off. But the core Connelly characters and themes have mostly been idle, aside from hit-and-miss movie versions of the books Blood Work and The Lincoln Lawyer. In an industry where best selling, mainstream authors are usually much more in demand, it’s curious that Hollywood has been so hesitant to explore Connelly’s nerve-racking version of Los Angeles, where everyone’s a potential killer, bureaucracy is as deadly as a bullet, and cops, Feds, attorneys, and private investigators fight with each other every day to hold onto their jobs and their lives. Amazon’s new series Bosch tries to rectify that oversight. LAPD detective Hieronymus “Harry” Bosch is Connelly’s most enduring creation, introduced in his Edgar-winning 1992 debut novel The Black Echo. 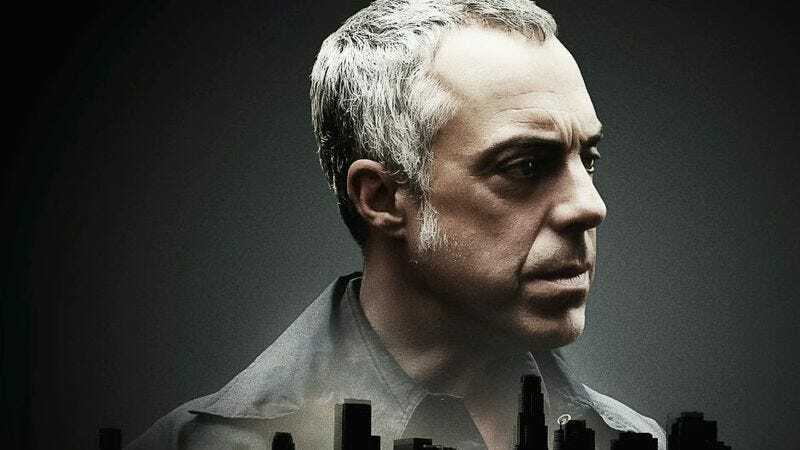 For Amazon’s show, Titus Welliver plays Bosch: a taciturn man of action, who prefers work to any kind of personal life, and has no qualms about violating protocols in the pursuit of justice. Welliver’s Bosch has a lot in common with Connelly’s: a tragedy-scarred youth as the son of a murdered prostitute; a military background, serving in Iraq and Afghanistan (instead of in Vietnam, as in the books); a nice house in the Hollywood Hills, bought with money Bosch earned from selling the movie rights to one of his investigations; and a willingness to hop into bed with women he considers his equal, even if they happen to be colleagues. The series weaves together plots from different Bosch novels, taking the case from City Of Bones—where a child’s long-buried remains spark a hunt for a serial murderer—and a public scandal over a Bosch shooting that figures in a couple of different books. Bosch was brought to the screen by writer-producer Eric Overmyer, a David Simon protégé who’s worked on Homicide: Life On The Street, The Wire, and Treme. Overmyer tries to bring the same level of seriousness and sophistication to Bosch, with mixed results. He’s assembled a prestige cast, top-lined by Welliver, who brings the proper amount of steeliness to Bosch, even if that means he’s a little too monotone overall. Welliver’s supported by Lance Reddick, Jason Gedrick, Steven Culp, Mimi Rogers, and others, playing the array of crooks, lawyers, and bosses that are often hard to tell apart in Connelly’s stories. But there’s nothing surprising about any of these performances—or any of these casting decisions, for that matter. There are no wild cards bringing a jolt of unexpected energy to scenes. These are all reliable pros, doing work that’s hard to fault, but also hard to hail. The series’ biggest stumbling block is that it’s stubbornly slow-paced. Eking out narrative is something Overmyer probably picked up from Simon, who’s a master at building stories through minute fractions, demanding that the audience wait until the last episode of a season to render judgment. It’s not like police procedurals—ones that aspire to realism, anyway—don’t demand a certain deliberateness. CSIs and Law And Orders wrap up cases in 40 minutes because the cases are their hook. Bosch means to be more of character piece, placing the detective’s meticulousness and lone-wolf tendencies in the context of a city defined by glitz, glamour, and every kind of sordid business imaginable. So in theory, the slow-drip approach makes sense. In practice, the pacing keeps Bosch from being as grabby as it should be. The best thing about Bosch is how well it captures Connelly’s Los Angeles. The pilot’s opening scene finds Bosch listening to a Dodgers game, parked in a spot overlooking the city’s skyline. Throughout the four episodes that Amazon provided for review, the detective drives through knotty freeways to secluded desert estates, seedy dives, dark woods, rundown suburbs, and the concrete-banked L.A. River, while dealing with skeptical superiors, pushy reporters, hard-working colleagues, and some truly vile criminals. Bosch’s directors—which include crime TV vets like Jim McKay and Ernest Dickerson—give the show an appealing coat of California noir, while Overmyer retains Connelly’s preoccupation with the cultural quirks and jargon of unusual jobs. 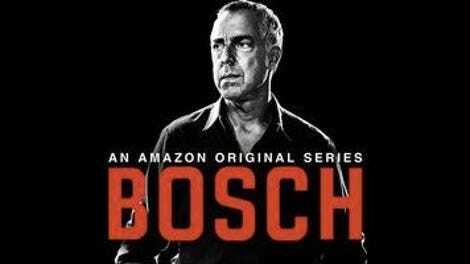 Bosch is packed with fascinating little tidbits, like how the force has a “kill party” after a police-involved shooting, and how the coroners lay out murder victims’ remains as a “city of bones.” Overmyer has a knack, too, for squeezing essential information into scenes that don’t just feel like backstory-delivery devices. Here, he fits most of the key facts from Bosch’s past into a few easy-to-take minutes of courtroom testimony. Perhaps this is why movie and TV producers have steered clear of Connelly for so long—maybe what’s so gripping on the page is too driven by internal monologues and wonky insider detail to translate to the screen. Or is it just unfair to judge a 10-episode drama (by a Wire veteran, no less) based on its first 40 percent? It could well be that the last half-plus of Bosch grows more complex in its characterizations and storytelling, and goes deeper into the unique cosmology of Connelly’s novels, where adversaries ultimately feed off each other and “success” is defined by a rough evening out of all the setbacks and small victories. On the other hand, another characteristic of Connelly’s books is that they tend to be riveting for the first 300 pages or so and then succumb to the contrived and generic once the good guys and bad guys finally face off in the final chapters. Perhaps Bosch will invert this pattern, saving all the excitement until the end. It’s certainly missing from the beginning.